The Koumaria New Media Art Residency, has moved from the Fall to the Late Spring! Since 2009 the artist collective Medea Electronique has organized an annual 10-day experimental artist residency, Koumaria, near Sparta in Greece (the village of Sellasia), focusing on improvisation and new media practices. New-media artists from all over the world, inspired by the Greek natural landscape, come together to create a multicultural and cross-media ‘dialogue’ culminating in a collective presentation both locally and in Athens at the end of the residency. Past residents have formed lasting friendships and new artistic partnerships. For us the residency serves as a model for future creative collaborations. The residency is held at an organic olive oil farm at the foot of Mount Taigetos in Sparta. The base for the residency, a modern and comfortable house, features dormitory-style bedrooms, large and comfortable common rooms (featuring fireplaces and magnificent views of the surrounding mountains and fields), two primary spaces for project development and practice, terraces, rooftop overlooks, and a large and modern kitchen. The surrounding hills, mountains, villages and the not too distant sea, coupled with a vast expanse of sky, stars, and ever-changing mountain vistas, afford the residents amble space and opportunity for creative work. Meals are taken communally, with an emphasis on fresh and local produce and traditional recipes. In this environment artists not only have the chance to live and work together interacting with the Greek landscape, but also to trade their experiences concerning everyday life and culture. Chores are undertaken collectively, but there is ample time for residents to work, create, explore the surroundings and enter into new artistic partnerships. this year’s residency is on the theme of Improvising the Archive/Archiving the Improvisatory. Medea Electronique has collected documentation (audio, video, photos, text, image) of its past ten residencies, in and about Sellasia, approx. 10 km north of Sparta. Focusing on site-specific mixed media performance, this material not only traces the history and development of Koumaria, but also that of the village of Sellasia—stories told, histories revealed, places explored, narratives uncovered. What are the potentials of an archive that is simultaneously a collection of cutting-edge site specific new media art, and a repository of village life and change? How can the improvisatory impulse behind the art created at Koumaria interact creatively, faithfully and responsibly with the highly improvisatory ways in which communities evolve and grow? What might an archive be like which can reveal both, and allow the archive visitor to themselves be an active improvising creative agent—an archivist of the archive? Given the theme, we are looking for artists excited by the idea of collaborative artistic creation, grounded in an improvisatory spirit and practice, who are excited by the thought of reanimating our archived works. We hope this call will be of interest not only to new and mixed media artists, but also to archivists excited by the idea of thinking about the archive itself, and methodologies for its creation and access, in new ways. It is worth emphasizing that Koumaria’s focus is COLLECTIVE art creation. Individuals should expect, and desire, substantive input from other residents, and be open to having their projects morph considerably during the course of the residency. While the final outputs we produce may each have a primary organizer behind them, Koumaria is not the place for the development and presentation of solo works/content. Members of Medea Electronique will be on hand to both assist in guiding the overall direction of the residency, and to fully participate in the residency as artists. While these members will be able to lend their expertise in assorted new media practices, and have great knowledge of the area, they are equal partners with the residents in the artistic production. 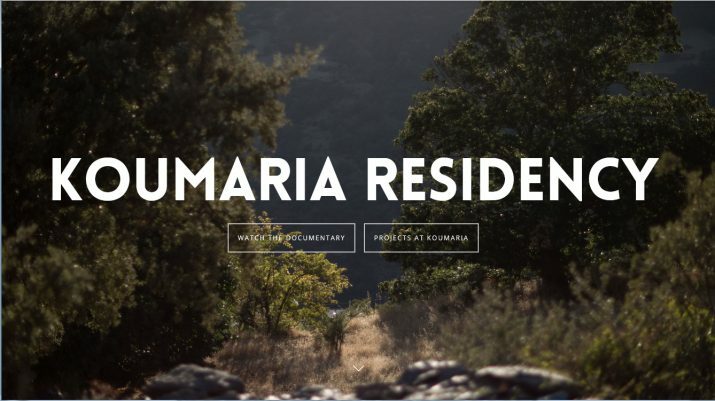 In other words, the Koumaria Residency is not a school, or workshop in new media art production run or taught by Medea Electronique, the residents are expected to be experienced in their chosen media, understand the use of the technologies they interact with, and come with these technologies or make it clear in advance what they will need to be supplied. improvised work, and interest in the archive project outlined above. We hope to attract archivists, particularly those working on innovative digital platforms for interacting with archives in creative ways.